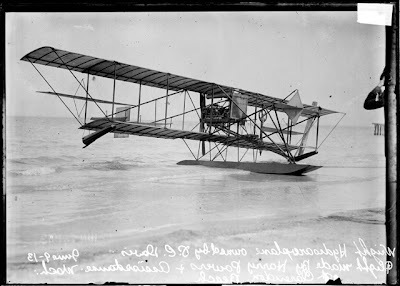 Original Caption: View of Wright hydroaeroplane owned by P. C. Davis that Harry Powers flew at Clarendon Beach at Lake Michigan, in the Uptown community area of Chicago, Illinois. This image shows the plane parked in the water at the beach. 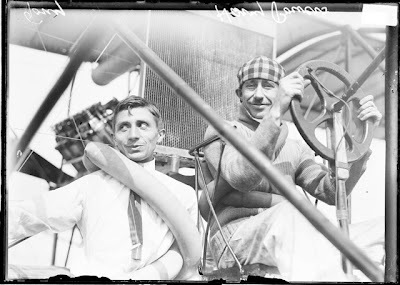 Original Caption: Portrait of aviator Harry Powers, and mechanic Tony Stadduman belted inside a hydroaeroplane at the Lake Michigan lakefront in Chicago, Illinois. Harry Powers flew the Wright hydroaeroplane that was owned by P. C. Davis from Clarendon Beach to Grant Park. 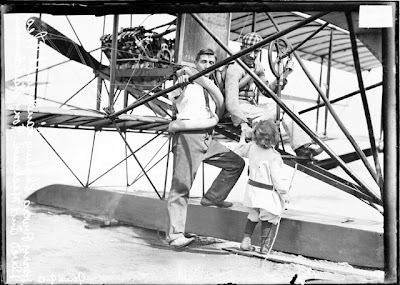 Original Caption: Portrait of aviator Harry Powers, belted inside a hydroaeroplane, shaking hands with Theo Daves and mechanic Tony Stadduman at the Lake Michigan lakefront in Chicago, Illinois. Harry Powers flew the Wright hydroaeroplane that was owned by P. C. Davis from Clarendon Beach to Grant Park. Source: DN-0009645, Chicago Daily News negatives collection, Library of Congress; DN-0009646, Chicago Daily News negatives collection, Library of Congress; DN-0009643, Chicago Daily News negatives collection, Library of Congress. Hey, I like your site. It's very helpful. I was wondering if you would like to exchange links. If yes, you can find my information below. Be sure to send me your information either by emailing me at jason@paranormalknowledge.com or by leaving a comment on my site. Thank you and Happy Holidays! I just noticed your recent post on the Wright Hydroaeroplane that flew from Clarendon Beach to Grant Park in 1913. This picture intrigued me a few years ago, because I grew up in Dayton, OH which is where the Wright Brothers grew up and did their airplane design work. It seemed to me to be odd that they would have a Wright plane here in Chicago and wondered why. What I learned from hours and hours of research blew my mind. The plane in the picture was part of an aviation challenge, of sorts. A prize was awarded for a competition to make hydroaeroplane travel commercially viable. Someone thought that this might make a good tourism idea and wanted to help bring it about. All of the young “hot shot” designers brought planes to Clarendon beach that year. One of the most promising designs crashed in the water soon after taking off from Clarendon Beach and the sensational press about the “failure” doomed the future of tourism of Chicago by hydroaeroplane. The guy in the picture is actually “Tailless Tony” Stadlman. The caption misspelled his name. Tony ended up working as a draftsman for Lockheed, then for Donald Douglas (whose company went on to become McDonald Douglas). Tony is credited for having designed the first “tailless” airplane, which was the precursor to the B2 Stealth Bomber. Anyway, thanks for all you do on this blog.